Skin-based input has become an increasingly viable interaction model for user interfaces, however it has yet to be explored outside the domain of mobile computing. 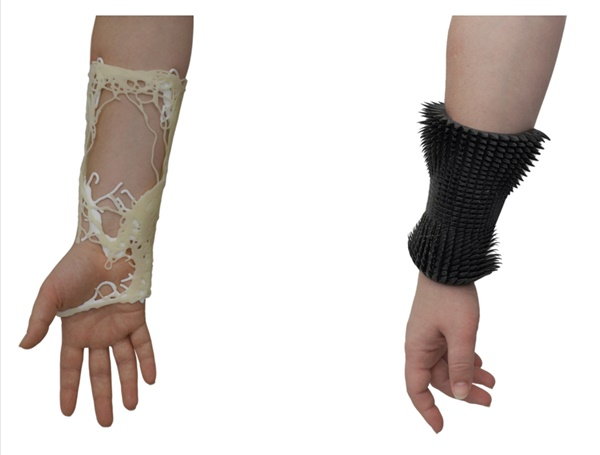 In this paper, we examine skin as an interactive input surface for gestural 3D modeling-to-fabrication systems. When used as both the input surface and base canvas for digital design, skin-input can enable non-experts users to intuitively create precise forms around highly complex physical contexts: our own bodies. In this paper, we outline design considerations when creating interfaces for such systems. We then discuss interaction techniques for three different modes of skin-centric modeling: direct, parametric, and generative. We also present Tactum, a new fabrication-aware design system that captures a user’s skin-centric gestures for 3D modeling directly on the body. Lastly, we show sample artifacts generated with our system, and share a set of observations from design professionals.